That was quick, in what is the quickest finish to a UFC fight ever Ronda Rousey secured 14 second submission win in the opening round to win her 9th career fight. 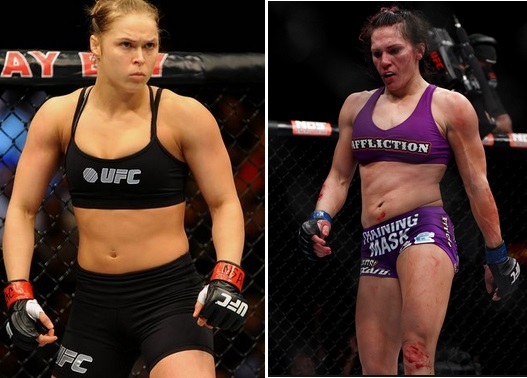 Cat Zingano was left shell shocked and want to do a rematch but in all fairness Rousey is just in another league. In the other co-feature main event Holly Holm started her UFC career with a good split decision win over Raquel Pennington. Take a look at the results of the full card which not really lived up to expectations. Ronda Rouse is expected to make around a $1 million from her nights work regardless of the result, she has a special contract with UFC where she gets a tiered based PPV share and she will be paid $2 or $3 for every PPV buy after initial 100,000 plus she will be getting a fight purse of $65,000 and another $65,000 if she manages to win. To watch the live action of UFC 184 you can tune buy the PPV or watch it through online stream sites. Once the fights are over where undercard fights are schedule to start at around 8 p.m. ET while the main event fights will take place somewhere around 10 p.m. ET, we will be placing short highlights of both main event fights on the night. Video Highlights will be available couple of hours after the fights are finished and we will update you with results and of course replay video of the big fight between Rouse vs Lingano. In UFC 184 women’s bantamweight champion Ronda Rousey will be taking on Cat Zingano in the main event of what should be a cracking of a MMA night for the fans. The co feature fight is another women bout where Holly Holm making her UFC debut vs Raquel Pennington. The undercard include some cracking fights as well with Jake Ellenberger taking on Josh Koscheck, Alan Jouban to fight Richard walsh and Tony Ferguson vs Gleison Tibau. Some of the undercard fights to be shown on Fox Sports 1 also have couple of good match ups.